The countdown has commenced and the excitement is building for India’s Mars Orbiter Mission (MOM) – which will conduct a detailed study of the Martian atmosphere and is the nation’s first ever mission to the Red Planet. The 56 hour 30 min countdown started at 6:06 a.m. IST today (Nov. 3), according to an official statement from the Indian Space Research Organization (ISRO) leading to liftoff on Tuesday, Nov 5, from a seaside launch pad in Sriharikota, India. MOM is the first of two new Mars orbiter science probes from Earth set to blast off for the Red Planet this November. Half a globe away, NASA’s MAVEN orbiter remains on target to launch barely two weeks after MOM on Nov. 18 – from the Florida Space Coast. 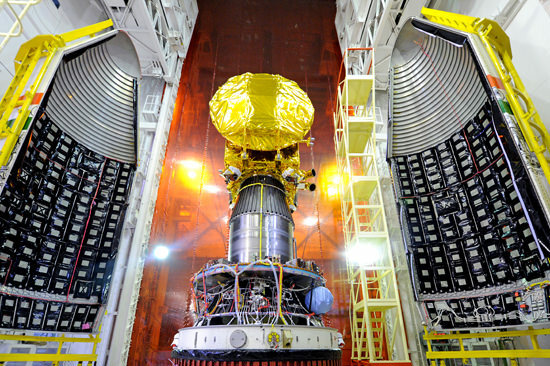 ISRO will broadcast the momentous MOM launch live at – starting at 14:00 hrs IST. “The Launch Authorisation Board has approved & cleared the PSLV-C25/Mars Orbiter Mission launch on Nov 05, 2013 at 14:38 hrs IST (9:08 UTC, 4:08 a.m. EST)” from the state-of-the-art Satish Dhawan Space Centre SHAR, Sriharikota, located on India’s east coast in Andhra Pradesh state. MOM is on schedule to lift off atop the powerful, extended XL version of India’s highly reliable four stage Polar Satellite Launch Vehicle (PSLV-C25). Fueling of the PSLV-C25/Mars Orbiter Mission rocket stages is now in progress following a completely successful dress rehearsal and launch countdown exercise completed on Oct. 31. “The filling of propellants into the Roll Control Thrusters as well as the Fourth stage of the PSLV C25 rocket [with mixed nitrogen oxides and monomethylhydrazine] is completed,” ISRO declared a short while ago. During the dress rehearsal the vehicle systems were powered, the health was normal and the spacecraft & launch vehicle integrated level checks were completed. Two tracking ships have been deployed to the Indian Ocean to relay critical in flight telemetry. The 44 meter (144 ft) PSLV will launch MOM into an initially elliptical Earth parking orbit of 248 km x 23,500 km. A series of six orbit raising burns will eventually dispatch MOM on a trajectory to Mars around December 1. Following a 300 day interplanetary cruise phase, the do or die Mars orbital insertion engine will fire on September 21, 2014 and place MOM into an 366 km x 80,000 km elliptical orbit. MOM arrives about the same time as NASA’s MAVEN orbiter. They will significantly bolster Earth’s armada of five operational orbiters and surface rovers currently investigating the Red Planet. MAVEN and MOM will “work together” to help solve the mysteries of Mars atmosphere, the chief MAVEN scientist told Universe Today. The 1,350 kilogram (2,980 pound) MOM orbiter, also known as ‘Mangalyaan’, is the brainchild of ISRO. ‘Mangalyaan’ is outfitted with an array of five indigenous science instruments including a multi color imager and a methane gas sniffer to study the Red Planet’s atmosphere, morphology, mineralogy and surface features. Methane on Earth originates from both biological and geological sources. MSM: the Methane Sensor for Mars measures traces of potential atmospheric methane down to the ppm level. Scientists will be paying close attention to whether MOM detects any atmospheric methane to compare with measurements from NASA’s Curiosity rover – which found ground level methane to be essentially nonexistent – and Europe’s upcoming 2016 ExoMarsTrace Gas Orbiter. Although there are no NASA instruments on board MOM, NASA is providing key communications and navigation support to ISRO and MOM through the agency’s trio of huge tracking antennas in the Deep Space Network (DSN). “At the point where we [MAVEN and MOM] are both in orbit collecting data we do plan to collaborate and work together with the data jointly,” MAVEN’s PI Jakosky told me. India would become only the 4th nation or entity from Earth to survey Mars up close with spacecraft, following the Soviet Union, the United States and the European Space Agency (ESA)- if all goes well. Past attempts to reach the Red Planet from both China and Japan have unfortunately failed. Some observers speculate that India’s MOM mission will ignite a new Asian Space Race. The $69 Million ‘Mangalyaan’ mission is expected to continue gathering measurements at the Red Planet for at least six months and hopefully much longer. Another interplanetary player steps up to the plate! When I first heard about this mission (From you Ken) I thought it was really cool, although unexpected, coming from India. I would have thought Japan or China would’ve been next? Got a little ol ‘space race’ heating up between China and India? aka… LOOK what I can do! Whatever.. the more the merrier! Good luck MOM! Well…. Japan, China and Britain had unsuccessful missions to Mars, let`s hope India won`t join them. be sure to read my new and last MOM prelaunch update. I have to agree. It’s exciting to see other countries expanding the boundaries of their space programs beyond LEO. The methane sensor is of great interest after MOM makes it good to Mars next year. If the count is zero as the rover did we can rule out any Martians to worry about and virgin Mars becomes the prime candidate for human colonization. That will be huge boost to our resources. A lack of methane would only rule out the presence of active methanogens, right? There are other types of life with other waste products imaginable. Good luck! This is not just India’s chance to triumph – also another nation representing Humanity in space exploration! Will there be a video stream of the launch? Thanks for the write-up. One typo- “Sriharikota” and not as mentioned in above 3 locations. Success is not divided in country , it is in unity . I hope that this mission will get success and we will get more unknown information about mars , which we don’t know now . Congrates, the Mars mission was successfully launched!! I was surprised to know that Rs. 450 crores spent on this mission was cheapest… great! Next PostNext What is the Milky Way?